There are countless books that extol the virtues of networking in todays fast paced business world. And indeed there are as many networking strategies as there are books on the subject. Although Tina Dezsi and Lia Bandola are designated as the authors, in reality they would be better described as the facilitators. The Power Of Women United is actually a collection of 22 stories by 22 successful businesswomen who share their insights into how you can achieve your goals. If there is a common thread in the book, it is diversity. These women come from very different backgrounds, and from a wide range of professions, consultants, book keepers, and motivational speakers to name but a few. They do share one thing in common, and that can be summed up in a single word, passion. They are all passionate about what they do, and that passion shines through in every story. One of the problems with a lot of self help books particularly self esteem management books is that they come from a single perspective, the author, as a result they tend to offer a ‘one size fits all’ solution. Alas ‘one size’ does not fit all, different people are driven by different wants and needs. The Power Of Women United offers the reader many perspectives, and each is summed up in a 10 page chapter. Keeping the concepts simple is a great idea, you can read the entire book, compare and contrast the different strategies and select what works best for you. A good example of that is what works for an extrovert does not translate well for an introvert. Although not related directly to the subject there are a number of wonderful anecdotes in the book, one lady, Carla Segato contributed a chapter titled The Pixie Dust Factor. Carla was a long time employee of the Disney company. She explains that the Pixie dust was an internal saying and referred to employees going the extra mile to accommodate their ‘guests’. She also talks about the need for vision, vision was something that the late Walt Disney had plenty of. The story goes that Walt took his friend Art Linkletter to an apple orchard in the middle of Anaheim California, here, Walt explained, is going to be a magical theme park called Disneyland. Art did not share the vision, and declined Walt’s proposal of becoming a partner. Walt and I walked back to our cars, and it was a long walk. I have since figured out that by not seeing Walt’s vision and joining his venture, each step I took back to the car cost me about one million dollars! A humorous aspect is broached by Lianne Harris Racioppo. Imagine that you are looking at a plate of bacon and eggs, which are you? The bacon or the eggs? Tina Dezsi and Lia Bandola are the founders of a large womens networking group the Power Of Women Exchange (POWE), you can find out more about this group of extraordinary women and their goals on their web site. You can order your copy of The Power Of Women United from Amazon. 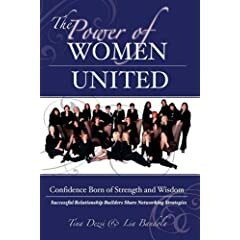 6 users commented in " Book Review: The Power Of Women United by Tina Dezsi & Lia Bandola "
Having read this book it seems to me that it’s just a simple “edit” of a number of unrelated “hobby” workers. I found nothing of value and no real examples of knowledge that can’t be found from your average “Google” search. Still I’m sure someone has made a few buck from these ladies. Firstly, nice cover. However the rest is not so good as the previous reviewer mentioned you won’t find anything new other than a self pat on the back for a few women who have banded together to throw together a “business” book. Nice try but is it worth the full price? Maybe wait until it hits the bargain rack before spending your cash. Knowing a couple of the people in the book I thought I had to read this (borrowed a copy and glad I didn’t pay for it). The whole book comes across as poorly conceived, simply thrown together and all together disjointed. While some of the stories tell a nice tale many of the others full short in delivery. If you can borrow a copy fine give it a quick read but really don’t waste money on it – at the very least as mentioned by Sally G in a previous comment wait for the bargain bin sale. When I first saw this book I thought at last a book that finally shows just how inspiring women in business can be. However, after reading the book it soon became clear this was just another “self promoting” PR piece for yet another band of self important women with nothing better to do with their money than cobble together a series of poorly written chapters so they can call themselves authors. My advise save your money and spend it at the spa – ladies you’ll thank yourself later. Fluff at it’s best in my opinion, hardly the stuff to motivate you just a few simply stories who started a business! So what 1000’s do this every day. My advice don’t waste your money or at least wait until it hits the bargain bin. Next! Not sure where to start really as the book is a mis-mash of short bio like chapters which almost seem more like PR pieces than inspirational stories. I was somewhat disappointed with the overall edit of the book which seemed thrown together and not at all what I was expecting. I would have difficulty recommending this book but then again it’s only one persons opinion and others may find something of interest. Given the amount of empowering books on the shelves of your local bookstore personally I think your money is better spent on one of them rather than this one. 3/10 for effort.